After Clinton's Strong Debate Performance, is There Room for Biden? FILE - Vice President Joe Biden. Ex-Secretary of State Hillary Clinton is widely perceived to have delivered a strong performance in Tuesday's debate, and some analysts say that could make it more difficult for Vice President Joe Biden to make a late entry into the 2016 presidential race. Biden is expected to make a decision within days about whether to run. The move would significantly shake up a Democratic Party contest in which Clinton has struggled to keep momentum amid an ongoing email scandal and an unexpectedly strong challenge from Vermont Senator Bernie Sanders. 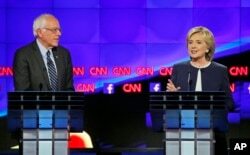 Sanders and Clinton were the main focus of Tuesday's debate, the first of the Democratic primary election campaign. Clinton did not disappoint, attacking Sanders and appearing to land blows on several topics, including gun control and economic policy, according to several analysts. "She had a command of the issues. She was calm, she was relaxed, and she was focused," Democratic strategist Craig Varoga told VOA. "And by taking Bernie Sanders on directly, I think [she] was also sending a message to Joe Biden that if he gets in the race, she's not scared of him," Varoga added. Sanders also did well enough to effectively keep it a two-person race, according to Varoga, who says it is now more difficult to identify a vacuum in the Democratic field for Biden to fill. Christopher Wlezien, a political science professor at the University of Texas, says Biden could still "shake things up" if he decided to run. But after Tuesday, "it's probably less true," he tells VOA. "Had she struggled, had the other candidates ganged up on her, had it been clear that she isn't up to the task, I think it would raise the possibility of Biden getting in… He still might get it, and he still may even be very likely to get in, but I don't think the odds went up after tonight. I'm guessing if anything they went down," he said. The question now is how much longer does Biden have to make a decision, since he is already behind in fundraising and will soon come up against several deadlines to register for primary elections and caucuses. "January is going to be too late," said Wlezien. "There are going to be some primaries and caucuses to commit earlier than that. And missing those dates would complicate for him." "My sense is that he probably has somewhere been 2-6, maybe 7 weeks, to really decide," he added. Biden's son, Beau, who urged his father to run for president, died in May from brain cancer. It was the latest personal tragedy for a man who also lost his wife and daughter in a deadly car crash decades earlier. Recently, Biden has said he is not convinced he has the heart, soul, energy, or passion to do the job. Those close to him say he is nearing a decision and will announce soon. "After what happened to him and his family, he's doing it on his own terms, he's doing it in his own way. He's not listening to the pundits and the commentators," veteran Democratic presidential campaign strategist Bob Shrum told VOA. "I can't predict what he's going to do. But I do believe that if he runs, it will restart the whole race, it will be a reset on the whole race. "He'll get a very serious look, and it will be a more complicated race. Hillary Clinton is the favorite, and she'll be the favorite if he runs, It'll be uphill for him, but he'll have a real chance," said Shrum.